“We are currently at the first stage of the operation,” Prime Minister Ehud Olmert told President Shimon Peres during a morning briefing, according to officials. In the fourth day of its assault on Hamas positions inside Gaza, Israel is holding the door open for more complex warfare unless Palestinians stop sending rockets into Israel. 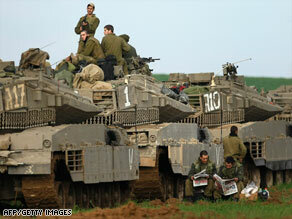 Above: A column of Israeli armored vehicles is deployed in a farmer’s field Tuesday near the Gaza border. But according to the Jerusalem Post, officials in Israel’s defense establishment have recommended to Prime Minister Ehud Olmert to suspend military operations against Hamas in Gaza for 48 hours and during that time to review a number of possible ceasefire solutions for Operation Cast Lead. The Israeli Defense Ministry said Defense Minister Barak would consider a proposal for a two-day truce to allow humanitarian aid into Gaza for the Palestinians. If the unilateral ceasefire fails, Israel would launch a ground offensive, according to Israeli defense officials. An Israel Defense Forces spokesman vehemently denied the reports by Israel’s Channel Two, Channel 10 and the newspaper Haaretz, CNN reported. Mark Regev, Olmert’s spokesman, said high-level government meetings were slated for Tuesday night and he was aware of no such proposal on the agenda. You are currently browsing the archives for the Jerusalem Post category.